Following the announcement of Just Cause 4 at E3 this year and to provide more information on what to expect from the game, here's the first five videos in the “Just Cause 4 Making Of” series. Straight from the mouths of the developers, this series delivers key, new information as well as detailing all of the most impressive new features in Just Cause 4. Apex Power - Named upon the concept of an Apex being a pinnacle or peak, the team at Avalanche discuss the new Apex Engine, built from the ground up to enable them to create the most dynamic instalment of the Just Cause series with best-in class features. Force of Nature - The team explain how Rico, a force of nature in his own right, will work through and with the elements of tornadoes, sandstorms and torrential rain, and detail the simulation systems necessary for allowing extreme weather the perfect combination of realism and fun. Grapple Hook - The embodiment of Rico is the grappling hook, the ultimate sandbox tool. Not only can it still achieve the same explosive destruction that players had in previous titles, it also now has new abilities, new options, and is fully customisable. Redefining Rico - A best in class sandbox with unrivalled physics would be nothing without a hero to match. A new challenge awaits for Rico, he has left the agency and gone rogue. He returns in Just Cause 4 with more depth and complexity, but is no less the action hero fans have come to expect. World of Solis - The team explains how they created 500 years of backstory to inspire the world design and narrative, from colonial style original settlers to contemporary buildings. 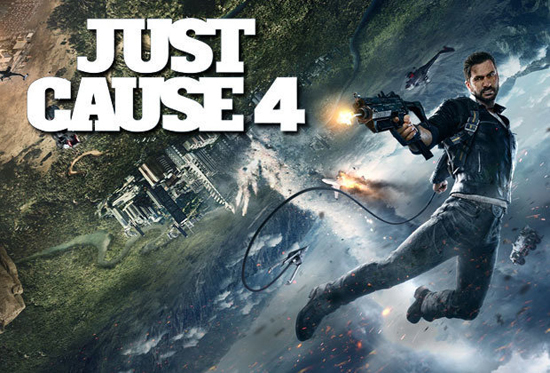 Set in the fictional South American world of Solis, JUST CAUSE 4 takes the series incredible destruction and unique physics to a whole new level with the introduction of fully simulated tornadoes and other Extreme Weather events. Rico Rodriguez returns in JUST CAUSE 4 with his trademark parachute, wingsuit and, of course his grapple hook, now enhanced with new functionality and fully customisable. Making it the most powerful and creative tool the player has ever had. Just Cause 4 is available to pre-order now before it is unleashed unto the world on the 4th of December.